Taking a dig at Prime Miniister Narendra Modi led BJP government, he said they have miserably failed to deliver on the promises it made during the election campaign of 2014 saying that a failed government and a failed prime minister needs to be shown the door. 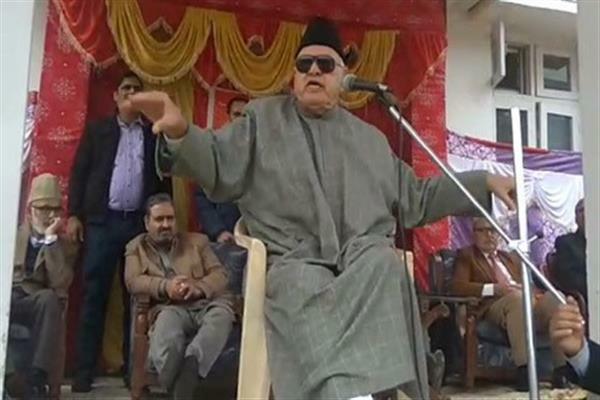 Party president while addressing a public meet at Mujahid Manzil, Budgam said that democracy is a humbling experience and that people of the country are seeking answers from PM Modi on issues of price rise and unemployment. Dr Farooq said that the PM Modi squandered the mandate of the people by its imprudent policies. “We in parliament knew that the government has failed to deliver on key issues that the country is facing, so they would create a war like situation in the country to divert the attention of people from the real issues affecting poor particularly farmers and the labor class,” he said. Party president while flaying the Modi led government for devaluing the institutions of the country by impeding their working. “The Modi government has tried to destroy the autonomy of RBI, and various other institutions. The autonomy of the institutions has been compromised,” he said adding that the Modi government and its ideologue RSS is sending a message that India is only for the adherents for a particular religion. “Not just that the religious minorities have been threatened, attempts were made to erode their political rights conferred upon them by the very constitution of India,” he said. Party president said that the agenda of BJP-RSS is divisive, and we saw how they are contriving to vitiate the atmosphere of our state.